Comparison chart of site progress over the years or over the last few months? Is there a way to compare Hinduism.SE's progress with itself over the years or over the last few months? What I want to see is a pic. like the one below for 2014, 2015 and 2016 to see if the numbers are going up or going down. Similarly, if anyone wanted, for every month of 2016. Is such a thing even possible? If not, does one of us need to manually capture data every quarter, every month etc. then do the comparison manually? You can find some snap shots for earlier months and year there. Note: LibreOffice Calc (free-software) is used for preparation of table and charts. Comment if any correction in values. There is an easier way to check the stats. 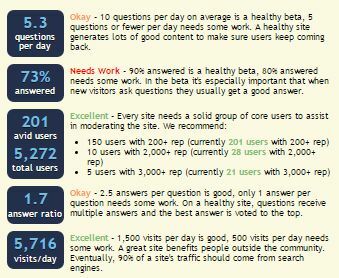 This is a privilege provided by the Stack Exchange for the users with >5k reputation (Only on beta sites. 25k on normal sites). So, you have to earn all the privileges for this one. The last privilege we get when we reach to 5k is access to site analytics. After this privilege, we get to see the History, Traffic sources of the site. This is a restricted privilege but it can be shared on meta for the analysis of the site. Here is the link to the site analytics. In the stats, we can have the data of questions and answers posted, votes cast. Votes include accept votes, upvotes and downvotes. Unlike a SEDE query, this information also includes deleted posts too. We can also see page views, visits, new visits in a given period of time. In traffic, we can see from which source, people are visiting our site. It is given in the form of pie charts. Not the answer you're looking for? Browse other questions tagged discussion support site-evaluation data-explorer data-dump . Is there a way of determining how many and which users were active on a given day? Are unanswered questions affecting the site's graduation? One year completed, where do we stand? Why flagging in Hinduism SE is not as per other SE Sites? Can the data “visited-number of days” be known/displayed publicly for any user?